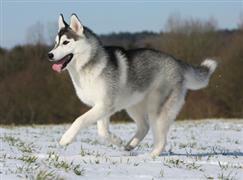 The Siberian Husky originates from Russia in the northeast region of Siberia. A few good Russian name ideas include Sasha, Nikolai, and Stefan. The Siberian Husky was originally bred by the Chukchi people that live in the area bordering the Arctic Ocean. Omryn is a common Chukchi name idea that means 'strong man'. The Russian name Chukchi is derived from a word meaning 'rich in reindeer'. Some name options borrowed from the famous reindeer known to pull Santa's sleigh include Dasher, Donner, and Blitzen. The Siberian Husky was bred to pull heavy loads through the extreme arctic cold. Some names related to the breed's ability to endure cold conditions include Polar, Alpine, and Tundra. The breed was first brought over to Alaska to be used as a sled dog. With the fastest purebred sled dog, a speed related name is always a good choice. Charge, Atomic, Bullet, and Dash are common names for quick dogs. Another popular use of the Siberian Husky is in skijoring, where one or more dogs is used to pull a skier. Some name ideas related to famous Olympic skiers are Vonn, Picabo, and Maier. A couple of defining Husky characteristics include a sickle tail and triangular ears. Names related to the sickle tail include Reaper, Blade and Grim. A few options derived from the triangular shaped ears include Scalene, Euclid, and Tangent. Some of our pages will contain a subcategory. A subcategory is a slightly more specific grouping than the main topic of the page. For a subcategory, we will include a separated table of names and corresponding descriptions. An example of a subcategory of Red Dog Names would be 'Dog Names Inspired by Red Wines'. If you have any subcategory ideas for the Siberian Husky Names page, we would love to hear them. Use the form below to submit your ideas.